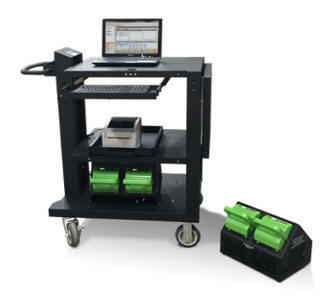 The PC Series Mobile Powered Workstation by Newcastle Systems has been designed to hold and power a variety of equipment, including a laser printer, yet also provides generous space to hold inventory. We can put together a quote for your specific workplace. Please contact us to help us understand your needs. You can also put a brief description of your needs in the Message Section of the Information Request Form at the bottom of this page. We respond promptly to all quote requests! To discuss your specific equipment application, contact us at (800)597-2525. Integrated Power - seamless rechargeable power and the ability to run several devices at once for 8-12 hours of normal use. with high performance 6" rubber casters and its narrow profile, it can be moved and positioned with minimal effort throughout a facility. Adjustable - using a slotted upright system, the shelves and accessories can be quickly adjusted in seconds to suit the operator's needs. It also boasts a weight capacity of 500 lbs. - a number of optional accessories are available and can be integrated in seconds. Create a highly versatile workstation that can be configured to suit any application.